Kim and Alex wanted simple but chic style for their fall wedding at Bridgeport Art Center. Judging by the incredible photos from Lisa Berry Photography, that is exactly what they got. Bridgeport Art Center set the stage for an urban, Chicago wedding. The wooden interior and stunning city views are absolutely breath-taking! Kim’s bouquet was filled with white anemone, lisianthus, garden roses, sweet pea, ruscus, eucalyptus, and more. Her bridesmaids carried smaller versions, that were sweet as could be. The reception at Bridgeport Art Center was absolutely stunning with tall olive arrangements that made an incredible statement in the room. 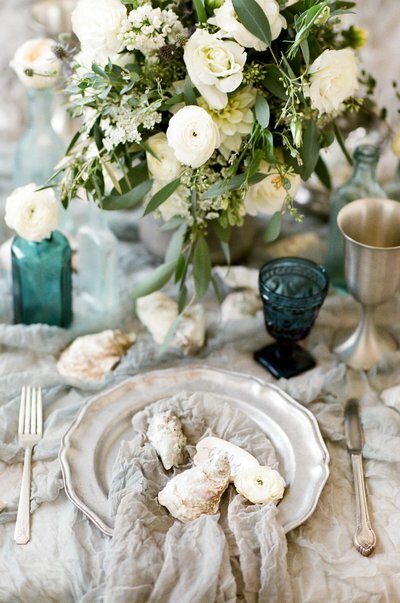 The low arrangements could be described as: simple, chic, and romantic. Two statement pieces had to be the neon sign and donut wall. The neon sign stuck out of a boxwood wall where guests found their seating assignments. The donut wall was a perfect touch for added sweets at the reception.